Some couples repair rifts in their relationships with expensive therapy. Beyoncé and JAY-Z tour stadiums together and surprise-release collaborative albums that mine their self-mythologized personal drama for big-ticket entertainment. 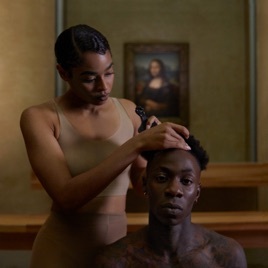 Sonically closer to Beyoncé’s 2016 high-art airing of dirty laundry Lemonade than Jay’s 2017 response 4:44, this isn’t just rubbernecking at the doings inside America’s royal family—it’s a challenging, tense, and thoroughly catchy summertime romp in its own right. When Beyoncé sings, “I can’t believe we made it,” in the appropriately aggressive “APES**T,” she might be referring to the détente in their high-profile marriage; she might mean this very album. The fun is in decoding—but it’s hardly the only fun. ℗ 2018 S.C Enterprises, under exclusive license to Roc Nation LLC and Parkwood Entertainment LLC, under exclusive license to Sony Music Entertainment.